Mars rovers, Spirit and Opportunity, have, by now, spent almost two years on the surface of Mars. They traveled several miles each, frequently stopping and analyzing scientific targets with their cameras, spectrometers and other instruments to uncover evidence of liquid water on Mars in the past. Their mission is a smashing success for NASA. 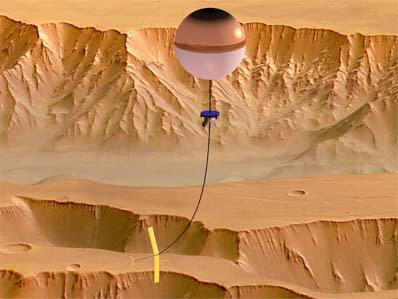 An artist's concept llustrates a guided balloon platform (with exaggerated dimensions) operating at Mars overlaying a Mars Express image [Copyright ESA/DLR/FU Berlin (G. Neukim)] of a canyon walls. The top of the balloon is aluminized, hence it reflects the Martian scene around it. But what if NASA had a platform on Mars that was able to cover these distances in a matter of hours instead and study the rocks on the surface in the same detail as rovers do? Scientific return from such a vehicle would be immense - scientists would be able to study the whole planet in greater detail in a time span of a single year. While orbiters can look at virtually any point on the surface of a planet, they lack the resolution provided by instruments on rovers or landers. Rovers, on the other hand, have limited mobility and cannot travel very far from their landing site. As the atmosphere of Mars is very thin, an airplane at Mars would last for just an hour until it runs out of fuel. Global Aerospace Corporation of Altadena, CA proposes that the Mars exploration vehicle combining the global reach similar to that of orbiters and high resolution observations enabled by rovers could be a balloon that can be steered in the right direction and that would drop small science packages over the target sites. The concept being developed by the Global Aerospace Corporation is funded by the NASA Institute for Advanced Concepts (NIAC). Balloons have been long recognized as unique, scientific platforms due to their relatively low cost and low power consumption. Two balloons flew in the atmosphere of Venus in 1984. In the past the inability to control the path of Mars balloons has limited their usefulness, and therefore scientific interest in their use. Global Aerospace Corporation has designed an innovative device, called Balloon Guidance System (BGS) that enables steering a balloon through the atmosphere. The BGS is an aerodynamic surface - a wing - that hangs on a several kilometer-long tether below the balloon. The difference in winds at different altitudes create a relative wind at the latitude of the BGS wing, which in turn creates a lifting force. This lifting force is directed sideways and can be used to pull the balloon left or right relative to the prevailing winds. Floating just several kilometers above the surface of Mars, the guided Mars balloons can observe rock formations, layerings in canyon walls and polar caps, and other features - at very high resolution using relatively small cameras. They can be directed to fly over specific targets identified from orbital images and to deliver small surface laboratories, that will analyze the site at the level of detail rovers would do. Instruments at the balloon's gondola can also measure traces of methane in the atmospheric and follow its increasing concentrations to the source on the ground. This way the search for existing or extinct life on Mars can be accelerated.